It is quite a common habit for users to use the bookmark feature to mark and record a good site for the next access or revisit. It saves hassle and time to relocate the site address again. However, as time passes, users might have problems of upkeeping and maintaining the browser’s bookmark. Users might notice their bookmark menu list getting longer and longer. They might have forgotten some of the bookmarks and never accessed these sites for a long time. These bookmarks could have”expired” and become irrelevant to users. To assist busy users to upkeep and clean up these old and expired bookmarks, Firefox users can try a free and tiny extension, namely Bookmarks Archiver. 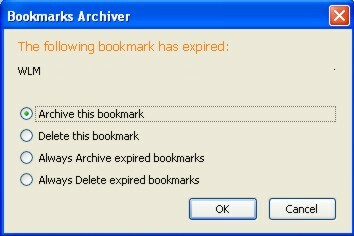 Once these bookmarks are categorized expired, users will be prompted a message to notify them of the expired bookmarks. Users will thence decide whether to archive or delete these bookmarks. The archived bookmarks will be saved in an archive folder. If an archived bookmark is revisited, the bookmark will go back to its original folder again. Bookmarks Archiver works only for Firefox browser in all Windows, Mac and Linux platforms. Bookmarks Archiver is useful for users who don’t have time to upkeep their menu list and want to look for a quick and straightforward measure to clean up the list.